The two television adaptations of the original Archie comics share their protagonist, a spunky Sabrina Spellman. In tone, plot and theme, though, they couldn’t differ more. The charm of the ‘90s sitcom version stemmed from Sabrina’s sassy black cat Salem and two bickering aunts — not to mention Melissa Joan Hart’s endearing performance. At its premiere, the original ABC show reeled in over 17 million viewers. After seven seasons, the quirky show left its mark on ‘90s teenage culture. 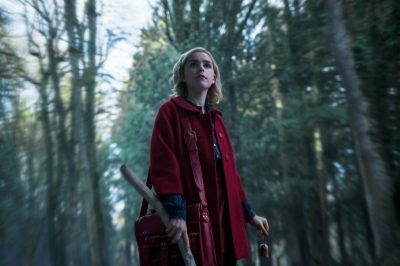 However, the new Netflix series serves the adult audience who graduated from the sitcom and can now stomach the dark world of Sabrina’s new hometown, Greendale, and its haunting past. Everyone is familiar with the Salem Witch Trials, but Greendale has quite a few skeletons in its closet. Perhaps a malevolent coven, even. In the realm of original Netflix content, “The Chilling Adventures of Sabrina” falls somewhere between “Mindhunter” and “Stranger Things.” The show immerses you into the dual world of Sabrina as she struggles to balance her mortality with her bewitched fate. As her 16th birthday and her dark baptism rapidly approach, Sabrina understands that her induction into the Church of Night means abandoning her ties with the human world. That means she’ll have to give up her boyfriend, Harvey Kinkle, played by the Disney veteran and Jeff Dahmer biopic star Ross Lynch. As supportive as he is clueless, Harvey can’t know about Sabrina’s double life. On screen, Lynch and lead actress Kiernan Shipka share an adorable high school romance. Shipka, a seasoned actress from her days on AMC’s hit series, “Mad Men,” flawlessly captures the essence of Sabrina Spellman. Strong-willed and driven, she plays a budding feminist hero as the show tackles relevant socio-political topics, such as transgender rights. The show feels reminiscent of the 1970s in the clothes and general attitude toward women, however Sabrina’s activism falls in line with the women’s movement of today. Writers of the show catered to an audience of politically aware young adults. Sabrina though, is tasked with tackling even darker forces. Her half-mortal, half-witch blood makes her a target for the seemingly intolerant side of the witch community. The show hits its greatest strides in its darkness. The ominous cloud that looms over Sabrina’s hometown creeps into almost every scene. Hazy shots of bodies and blood leave an unsettling taste strong enough to erase any memories of the original laugh-tracked sitcom. Early on, the show establishes the classic Hollywood trope of a difficult teenage adolescence, but the story goes much further than typical jocks and bullies — although they make an appearance, too. Sabrina’s mortal and satanic enemies linger at every corner, but her teenage spirit pushes the plot forward. The only light to cling to is Sabrina’s dissatisfaction in the ways of the past and her practical acts of rebellion. She doesn’t just meet resistance on the outside, though. A coldly uncompromising Aunt Zelda (Miranda Otto), who overpowers the kindness of Aunt Hilda (Lucy Davis), reinforces the notion that Sabrina has it tough everywhere she goes. The dynamics of the Spellman home don’t exactly inspire any sympathy for the Church of Night that seems suspiciously desperate to baptize Sabrina. To sign her name in the Book of the Beast, or not? If only Sabrina had her parents to turn to. Her parents, of course, are dead. It wouldn’t be a good coming-of-age story without at least one absent parent. The “accident” surrounding their death seems all too convenient for even the least cynical viewer. Luckily though, “Chilling Adventures of Sabrina” gifts Sabrina with a cousin she can turn to for all her witch and worldly problems. Ambrose Spellman, played by Chance Perdomo, guides Sabrina through hexes and Harvey problems. Their relationship gives viewers solace in the knowledge that Sabrina isn’t operating completely alone. Despite all the forces working against her, the show sets a tone that insists Sabrina won’t be defeated. With “Chilling Adventures of Sabrina,” Netflix satisfies the adult Sabrina Spellman fan looking for a Halloween chronicle that takes us to a different world with all the same problems of the mortal one. The first episode lost me the moment one of the teenage characters used the term “white patriarchy”. Nope.